What is the Unit Circle? The unit circle is a circle, centered at the origin, with a radius of 1. This circle helps us find the exact values of some trigonometric functions and not the decimal approximations the calculator will give us. For example, it’ll help us find the exact value of sin or cos30°. You don’t have to memorize all the values of the trigonometric functions, you just have to understand the unit circle. 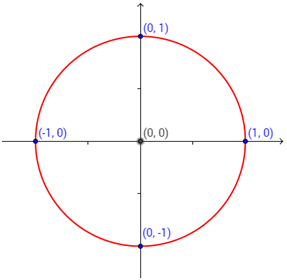 Let (x,y) be the point on the circle that is in the first quadrant. The lengths x and y become the legs of a right triangle whose hypotenuse is actually the radius of our unit circle, i.e. the hypotenuse is 1. Now let’s use some right angle trigonometry. Note that angle θ is acute. Sine is represented by the vertical leg. Cosine is represented by the horizontal leg. This is called the Pythagorean trigonometric identity and it is very useful. 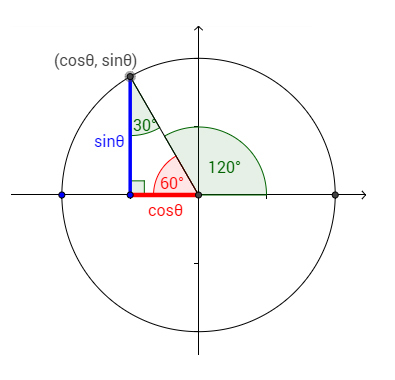 If you are asked to find sin60°, you would just need to look up for the y coordinate of the intersecting point on the circle. 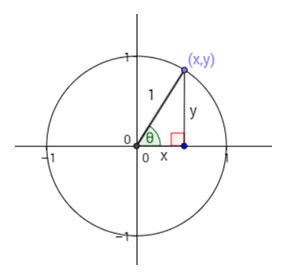 To find the cosine of the same angle, you just look up for the x coordinate of the same point. This might seem a lot at first, but there’s a trick to help you learn this faster. For sine of 30°, 45°, and 60°, you should try to think “1, 2, 3” for the square root number in the numerator. The denominator is 2 and will stay the same. For cosine of 30°, 45°, and 60°, you should try to think “3, 2, 1” for the square root number in the numerator. The denominator is 2 and will stay the same. So actually, it’s just these three numbers: that you need to memorize. Tangent will be equal to . 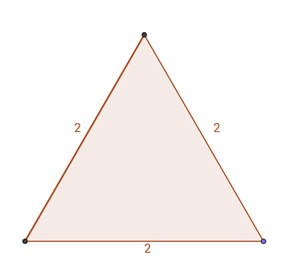 Another way to help you remember the 30° and 60° is the special triangle. Cut it in half. According to Pythagorean theorem, the new side is √3. Now you can find the sine, cosine and tangent using soh cah toa. If you have trouble with this concept, please check out our in-depth SohCahToa guide. You can find the values for 60° angle the same way. The mnemonic ASTC (All Students Take Calculus) can help you remember which ones (sine, cosine, tangent) are positive in which quadrant. Did this help? Learn more topics in Trigonometry and 100+ other subjects at Educator.com, the best place to get in-depth and instant homework help online. If you want to convert degrees into radians, simply multiply the number of degrees by . If you want to convert radians to degrees, simply multiply the number of radians by 180/π. 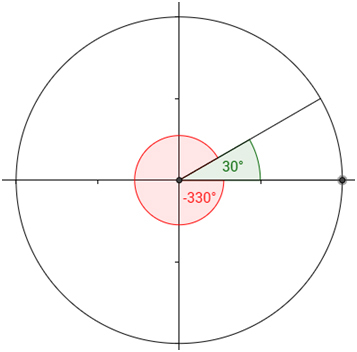 A reference angle is always positive and is ≤ 90º. It helps us determine the value of sine, cosine and tangent of an angle that is larger than 90°. 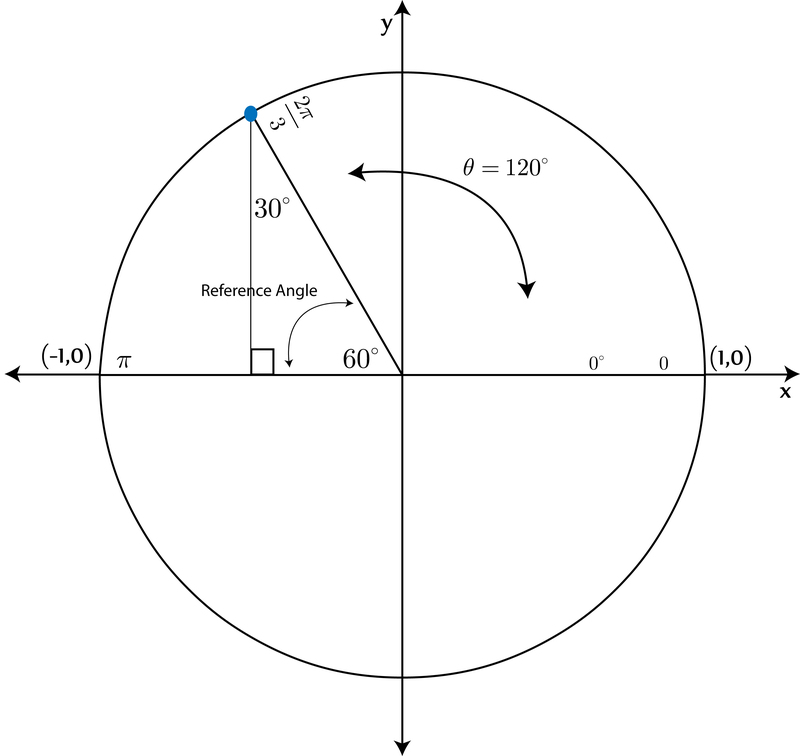 How to find the reference angle? The coterminal angles are angles which, drawn in standard position, share a terminal side. For example angle 30° and angle -330°. If the angle is negative, keep adding 360 until the result is between 0 and +360. If the result is the same for both angles, they are coterminal. 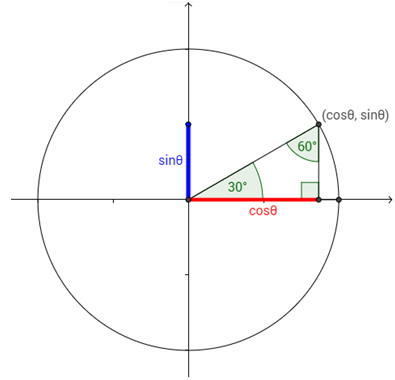 These angles are important for us because they have the same value for the trigonometric functions. Example: Let’s prove that angles 60°, -300° and 420° are all coterminal. The result is the same for all angles so, they are coterminal. 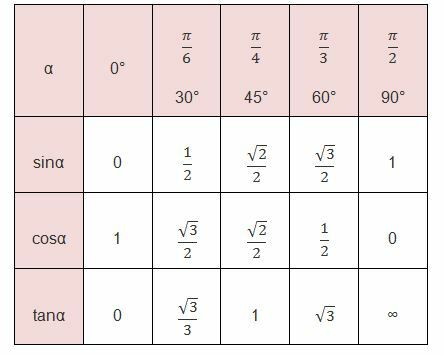 Here is a simple unit circle chart that summarizes all the important angles on the unit circle and their sine and cosine values. Here is a practice unit circle chart that you can use to test your memory. Let’s do an example problem. What if you have θ=30º and you want to find the cosine and sine for it. We can get the answer straight from the table, or we can use any of the tricks we have mentioned above. Let’s use the first one. What if you have θ=120º and you want to convert it to radians, identify the quadrant, and find its cosine and sine? Step 2: This angle is in the second quadrant (greater than 90° and less than 180°). 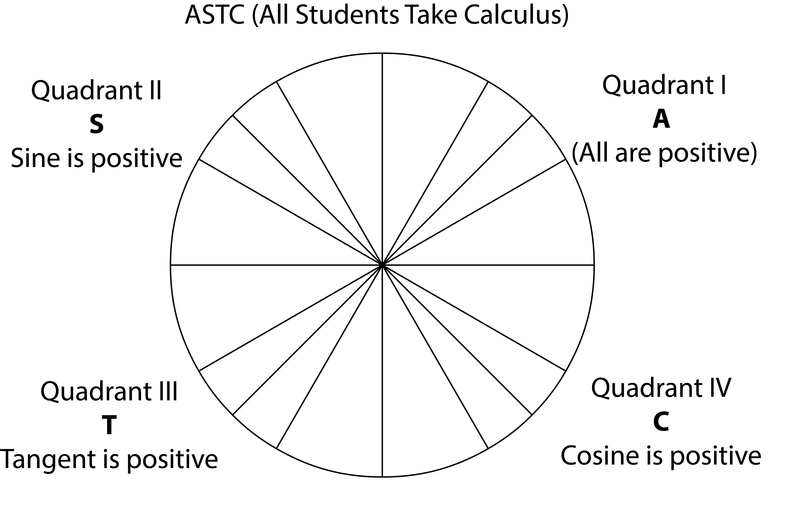 Using mnemostic ASTC (All Students Take Calculus), we can identify that only sine is positive in this quadrant. Cosine is negative here. Step 3: When the angle is in Quadrant II, we will subtract it from 180 to figure the reference angle. Learn more topics in Trigonometry and 100+ other subjects at Educator.com, the best place to get in-depth and instant homework help online.